acTVism Munich organized an event at the Muffatwerk in Munich, in which the significance of whistleblowers, activism and the alternative media in the 21st century were discussed with Noam Chomsky, Paul Jay, founder of the Real News Network, and Annie Machon, former MI5-Officer turned whistleblower. State or corporate media outlets are driven by the motive to maximize profits, or in some countries like Germany, state media forces citizens to pay a monthly fees that some experts and activists consider is unconsitutional on the grounds that citizens should have uninhibited and free access to a wide range of information that they consider is a prerequiste to making informed decisions towards the political process. State and corporate outlets also depend heavily on corporate sponsors and/or advertisements agencies and have the inherent tendency to become highly concentrated, both in times of economic growth or contraction. Given this institutional framework and economic environment, state and corporate media outlets are prone to omit or distort information in favour of monopolized interests instead of serving the public interest. 1980-1990: Fifty giant frrms dominated almost every mass medium [in America in 1983]; but just seven years later, in 1990, only twenty-three firms occupied the same commanding position. 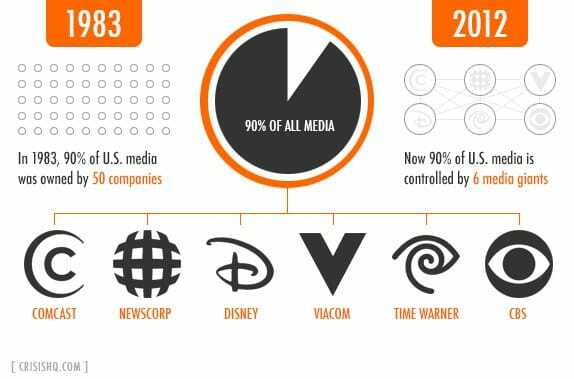 Today: 6 Corporations control 90% the media landscape in America today. Did you know that propaganda, media manipulation and public relations were issues that were hotly debated and discussed in academia after World War I?